I’m anything but a diehard sports fan, but I’ve noticed over the years that certain sporting events become unforgettable when they mark key moments in my life or our collective life. Do you remember how moving the Super Bowl was in Feb., 2002? Our nation was still hurting after the 9/11 attacks, but here was proof that we were not going to let anyone stop us from celebrating life. I thought of my father yesterday. Football was one of the ways he and I connected. Thirty years ago, he and I talked on the phone with growing excitement as the season progressed, and this new quarterback, with the unusual name of Joe Montana, led the formerly hapless 49ers to their first ever Super Bowl victory. The best game of the season, however, was the Division Championship game. 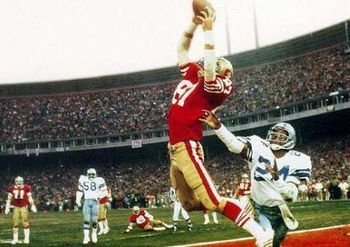 Montana won it with an 89 yard drive after the two minute warning, and a justifiably famous touchdown pass to Dwight Clark with less than a minute to play. This wasn’t just a persona moment; it set the entire region on fire after a difficult decade. My father moved up here to be with us in 1999, after he was diagnosed with a wasting illness. Mary and I spent most of our Sunday afternoons with him during football seasons. First lunch and then the afternoon game. My father died in 2007, and we haven’t watched much football since. Until this season. Until our “formerly hapless” 49ers took off so dramatically you couldn’t help but notice and want to follow along. Yesterday it happened again, 30 years later, almost to the day. The niners won the Division Championship game with another spectacular drive and touchdown pass, this one with only seconds left. Another on-your-feet, unforgettable moment. Hopefully, something to rouse all of northern California after a difficult decade. My father would have loved this game. I don’t go in for sentiments like, “Maybe he was looking down from heaven.” Hopefully those in the afterlife have better things to do than peer over our poor shoulders. But I do believe – and I’ve heard various spiritual teachers hint at this – that the ancestors and those who are gone can pick up our prayers and love and kind thoughts. That’s a pretty good deal. And if football is the occasion, there is nothing wrong with that. This entry was posted in Culture, Family, Sports and tagged Culture, family, Sports. Bookmark the permalink. LOVE the poem! We don’t watch much football anymore either, but I sat in the hospital with my husband and we watched the second half of that game. It was the most exciting last four minutes of football either of us could remember and it put a smile on my hubby’s face. That was great! And, yes, your dad would have loved that game.